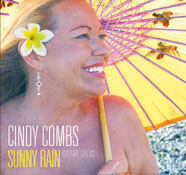 The story of Cindy Combs begins in San Diego, meanders around the globe to places as far away as the Canary Islands off the coast of Africa, pauses on O’ahu, and rests finally on the Garden Isle of Kaua’i, the setting for SUNNY RAIN. In the retelling of her journey, Cindy often related the story of her open-mouthed astonishment when listening to a radio broadcast in the Canary Isles where she and her family lived in 1962. Her mother suddenly began singing along, “Ha’ina ‘ia mai ana ka puana…” Cindy marveled, “How do you know the words to that song? It’s beautiful!